This dessert really looks great in an old fashioned footed bowl, or English Trifle Bowl. If you don’t have access to either, use a 12x9x2-inch oval bowl. Pour the cold coffee into a large pie plate and dip enough of the lady fingers into the coffee, quickly, to cover the bottom of the dish. If you are using a Trifle bowl, enough to cover the sides of the bowl. Stand them upright around the inside of the bowl. Work quickly. Don’t let the savoiardi linger too long in the coffee and get soggy and break. Dip them in quickly and place them just as quick. In a large mixing bowl, whisk the egg yolks and sugar until frothy; add the mascarpone and Marsala and blend until smooth. In another bowl, whisk the cream until stiff and then fold into the mascarpone mixture until well blended and smooth. Using a pastry bag pipe about half of the mixture over the bottom layer of savoiardi. Then dip more savoiardi and place on top of the mascarpone mixture. Pipe the remaining mascarpone over these lady fingers. Cover with plastic wrap and chill for at least 6 hours. When serving, sprinkle with cocoa powder and spoon portions into small dishes. 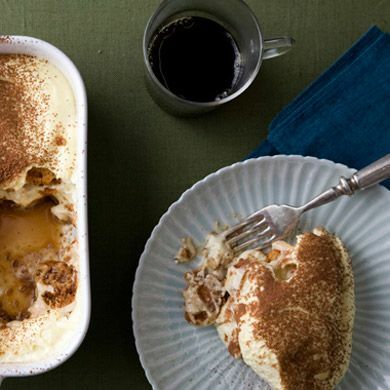 Tiramisu is a traditional coffee and mascarpone spoon dessert. It is rich and very full of flavor. Using a Trifle Bowl to serve makes a grand presentation. However, I have seen it served where two layers of savoiardi were piled on top of each other on an oval platter. I have also seen it served in a soup dish. However it is served, it was always great tasting and a real meal closer.